Summary: The BodyMax Fitness Strength Trainer Multi Gym caught my eye immediately – for 2 different reasons. First, it has a unique look to it, especially the ‘wings’ bringing the curl / pec bars into place. 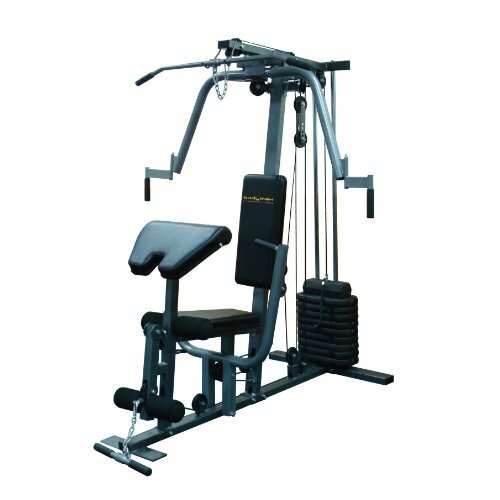 Second, the name – BodyMax has a well deserved reputation for solid and reliable home gym equipment that does not have the premium price tags of some of the other weight training brands. This gym includes a 50kg (110 pounds) weight stack, plenty enough for the variety of exercises on offer. You can check out the (so far very positive) feedback on the dedicated amazon.co.uk product page here. You’ll get a complex looking home gym, which arrives in 5 separate boxes. As always with gyms, some assembly will be needed. Unlike many products, nobody has (at the time of writing!) complained in the comments about how difficult this was! While the preacher curl bars are what draws your eyes when you first see this home multi gym, there is a lot more too it than that. Above this is a pull-down bar (which changeable extension)and up front a hyperextension bench. If you look at the floor in front of the leg press, you will see a chain with a smaller bat on it. There is also a seated chest press. In total you’ll be able to do 20 different exercises, which is excellent from a relatively compact home gym setup. This gym operates via a pulley system. This means that for certain exercises, the overall resistance can be bigger than the sum of the weights. In this case, you to 200 lbs in possible in certain spots. One question concerned adding weights to the stack. This would involve taking apart the main structure, and does not appear to be an easy job. There are options out there if you need more weight, check out my best home multi-gyms page for the options. Overall this is a solid gym, as you’d expect from a maker of kettlebells and other free weights (as well as exercise machines). This is a relatively new model, having been added to the BodyMax range last year. It is listed as the ‘Big brother to the BodyMax CF370’. You can see my review of that multi-gym here. Of the 4 people who left comments at the time of writing, 3 of them left 5 star reviews and 1 left a 4-star review. Even the 4-star was positive in the words, calling this easy to assemble and good quality. The other comments are on the shorter side too, which might well indicate that the buyers were too busy training to spend too much time on long-winded reviews. This is a mid-priced gym, which offers a lot of different exercises, plenty of resistance and the solid and reliable build you’d associate with BodyMax. The weight stack is 50kg, though the use of a pulley system means you can get a lot more resistance, depending on the exercise. This gym will need some dedicated space, though for me it is versatile – offering a lot of options for a fair price tag. Check out the spec and the latest comments from buyers for yourself on the dedicated amazon.co.uk product page now!